Well, after telling all of you about it, I couldn’t resist. I started THIS quilt. I made a few blocks to see how it’s gonna go, and I have all of it cut out. I’m doing mine all in dark blues, with bright crosses in several colors. I need to use up a lot of blue this year! 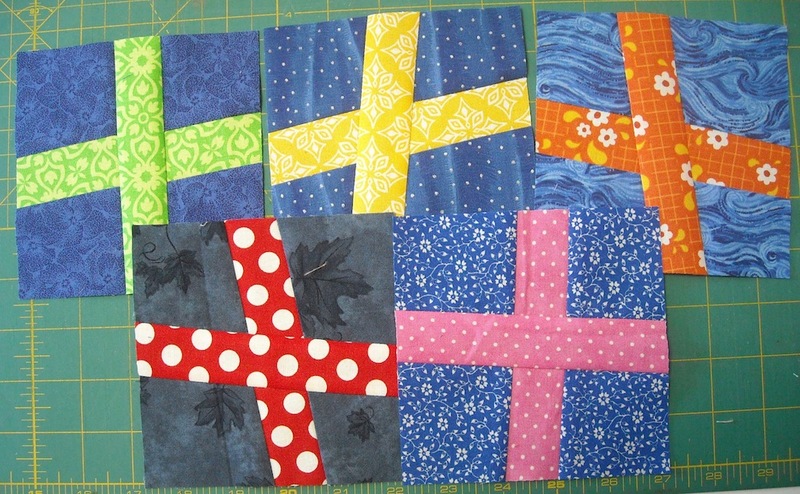 I pulled all the blue squares from my 5″ square bin. Did it make a dent? NO, it did not. 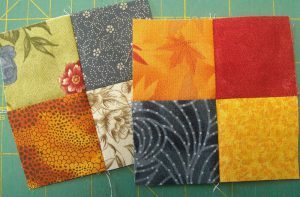 But it was almost half of what I needed for the quilt, so I had a good start without even doing any cutting. I cut the rest from my stash. I tried to pull all the smallest pieces so it would use them up and I wouldn’t be putting them back in the bin. It didn’t seem to make a dent there, either. And I’m making the quilt bigger than she shows it, just so I could use up more fabric! 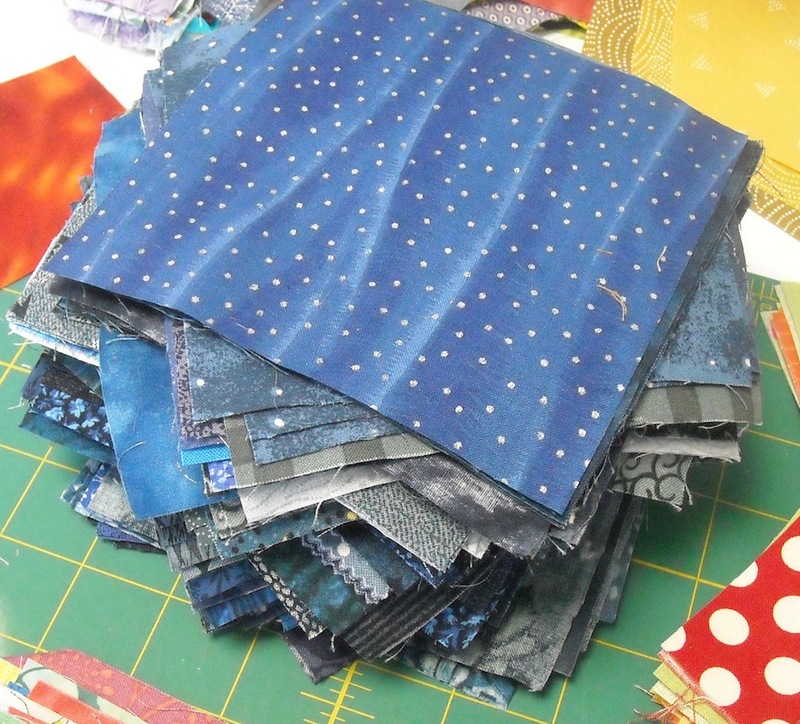 Methinks I could make about 50 more blue quilts before my blue fabric is gone. Ugh! 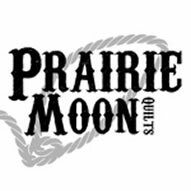 I’m planning to piece the backing for this quilt from my blue stash, too. 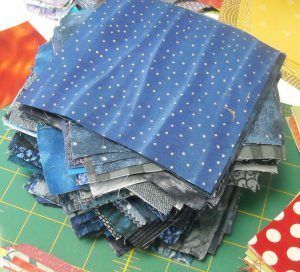 I got all the pieces cut for the Log Cabin quilt I’m making using THIS tutorial from Sherri at A Quilting Life. I cut most of this while I was working through my scraps, so it got done without really having to think about it. Once I had the colored strips cut, all I had to do was go back and cut out all the background pieces, which didn’t take long, since they were all from one color. I had to put a couple of blocks together to see how it’s gonna look. I like them so far! I hope my idea for a soft, sunny-colored end result works out. My background is a very pale hand-dyed yellow. I’m making some little tiny 9-patches, too. These will finish at 3″ square. I’m making them to go into a bigger block that will use up my pre-cut sizes. 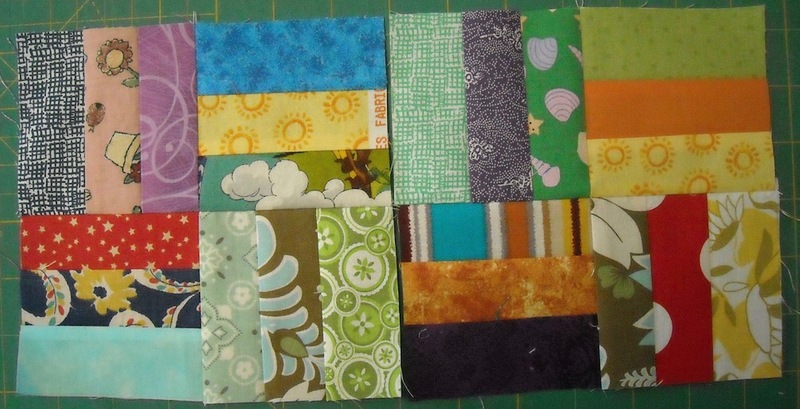 These squares all came from the 1 1/2″ square bin. I’ll show you the blocks when I get a few done. I’m trying to use up my darker and more traditional fabric scraps on this one. 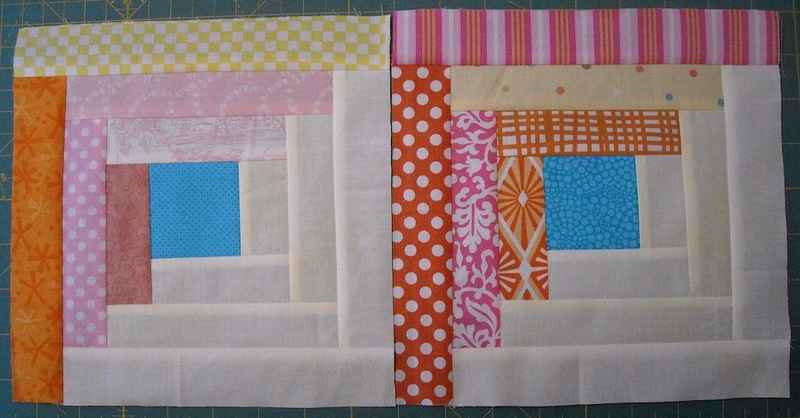 These little 4-patches are for the same quilt. I’ll show you more of it later when I have enough done for it to make sense. I’m still making Forever Fencin’ units from my bright strips as I get time, and I finally started to put some of those together just to see how they’re gonna look. This quilt is gonna be very scrappy busy! Most of this has just been my leader/endering stuff while I’m working on bigger projects, some of which I can’t show you for awhile (as usual). Every seam gets me closer to done on some project or another, even if I only grab little bits of time to work on them. So if little bits of time are all you can get, don’t discount them for getting you further along toward finished — every stitch counts! And I certainly need for every stitch to count if I’m gonna get 25 scrap quilts finished this year. February is almost over! I keep trying to remember to link up to Angie’s WIPs Be Gone party, so this time I’m doing it! Go check out Angie’s blog HERE. I’m hoping I can do this more often, if it will help some WIPs Be Gone! If it makes you feel any better you aren’t the only one with a blue fabric problem! All my yardage fits in 4 drawers. One whole drawer is dedicated to the blues!! 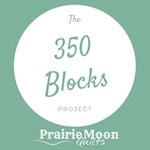 So there are 5 extra blocks all ready. 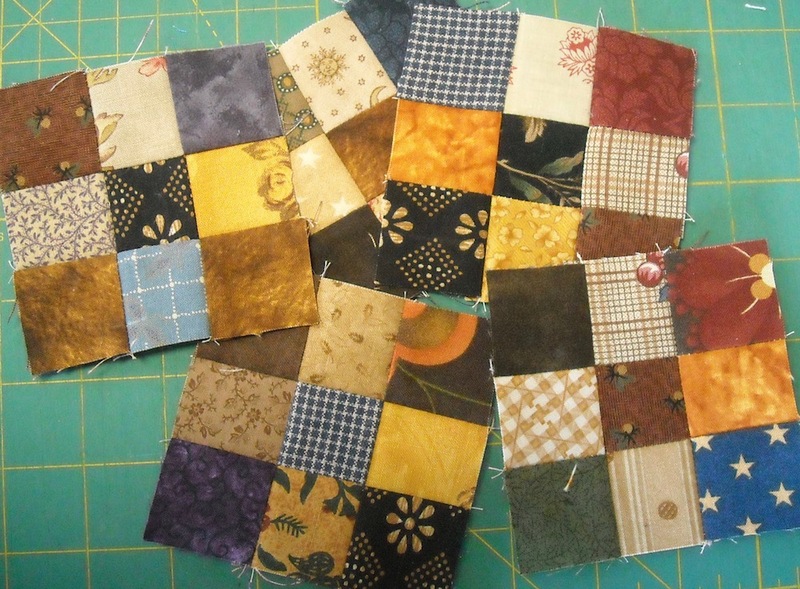 I started on a purple wacky crosses scrappy..
Scraps do NOT live in my house! 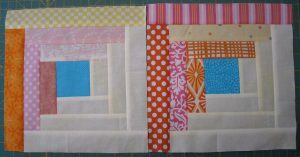 All extra blocks and scraps go into the quilt back (perfect match!). If a few still remain a mug rug or pot holder gets made, and last resort a 9-patch or snowball block for a dolly quilt. I consider anything 1/8 yard or larger fabric and it goes back in the stash. I have so much other stuff to which I cling, I would drown if I added scraps. I do enjoy reading how you scrap collectors cope with them. Just wish I had that many creative ideas for all the stuff I DO keep!! Now that’s a good idea, Marlene! 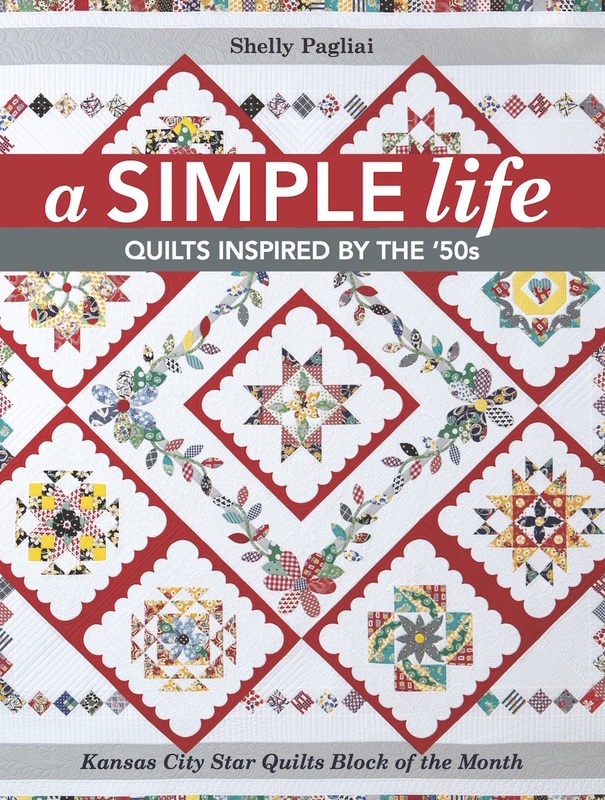 Hmmmm….I may need to make that quilt with my blue scraps, too! Hmmm. Looking at my stash mine will be green, but not until I get a few things done. I always like to add to my leader and enders projects. You’ve inspired me to de-stash some more, Shelly. Thanks for linking to WIPs Be Gone – it’s open til Thursday, midnight. PS I love yours in blue! You know I looooove all this scrappiness! 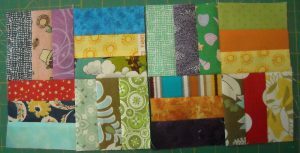 I could easily make 25 scrappy quilts this year too…but I’m NOT adding that to my to-do list, mmmmkay? Oh gosh, you’re making my head spin. I want to make it all! Surely you’ll have made a BIG dent in that stash come December! My husband swears that the more I use my stash the more it grows, lol. 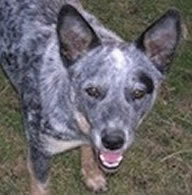 Just found your blog and had a look over at the ‘animal’ blog. Oh. My. Goodness. My husband and I were laughing so hard. You have a great sense of humor and wish you would write more. Wow, I’m so amazed at all you accomplish! Great job and great motivation for me to read less and sew more! When I retired, I looked forward to joining a book club. I’m glad there’s some time for both activities. This month I’ve finished UFO’s and projects which didn’t require making blocks! I better make some blocks quick as February is almost over! What about those 3.5″ snowballs? I am still cutting on those from my scraps. I will take a picture sometime soon and send it to you. I have a pile of them already, but not enough for a quilt like we saw yet.